Prior to the start of the 2009-2010 contest season I was looking to added another antenna to the “farm” that seems to be growing in the backyard. While my XYL is not happy at “yet another antenna” I decided on building a hex beam. Originally I was looking at the Super Antennas YP-3, a 3 element yagi, with a 21′ mast and rotator to erect on a temporary basis in the backyard. I also consulted more experienced hams for potential alternatives. While the hex beam is not a new antenna design, it was one I did not consider, but seemed to fit what I was looking for. After reading Leo Showmaker’s site, Hexagonal beam by K4KIO and Understanding the Hex beam by G3TXQ, Steve Hunt I started to put prices to the parts list, some of which was available from hardware stores. 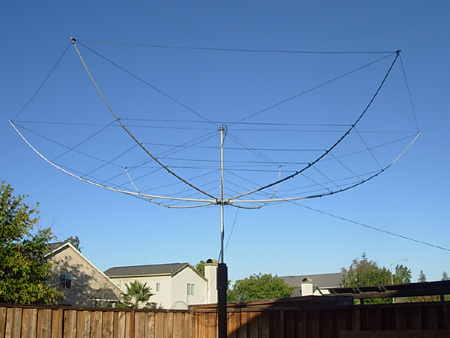 After reading the article March, 2009 issue of QST it was decided I would add the 5-band hex beam to my collection. I did consult Steve, WB2WIK for his input to my dilemma and he offered up his opinion and thoughts. After putting together the parts and price list I looked at the DX Engineering 5-Band Hex Beam. While the price was a bit higher than anticipated ($599) when you could piece one together for a few hundred less I had been very pleased with my previous dealings with DXE and decided to pay the price and placed my order. Since building this antenna and getting it erected on a mast I could not be happier. Coming from using strictly vertical antennas, the hex beam seems to do a very good job, even being limited at 6 meters in height over my garage. There are plans in the works to purchase a Rohn H50 mast and place a CDE Ham-M rotor on it, the alternative is place the hex beam on the rooftop.